Building on last week’s review of Buckminster Fuller’s 1928 Ideas & Integrities, this week I want to honor one new book and reinforce that book with mention and links to several others, all of which make the same point in different ways: we have the power to design a world that works for all. 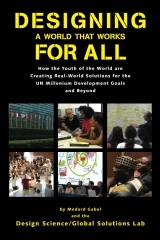 Designing a World That Works for All: How the Youth of the World are Creating Real-World Solutions for the UN Millenium Development Goals and Beyond (Volume 1) by Medard Gabel and his many international students is in my view revolutionary — a milestone in human applied thought. Having attended two of his design sessions with some of the students he has mentored in this long-running endeavor, it has been my privilege to share in the “aha” experience when, half-way through the session, all of the smaller teams working on disparate things like agriculture, energy, transportation, water, et cetera suddenly realize that everything is connected and nothing can be designed properly unless it is understood in relation to everything else. Medard was the co-creator with Buckminster Fuller of the analog World Game, and has recently drawn up the preliminary cost and process estimates for creating the digital EarthGame, in which we all play ourselves at every level, with transparent access to “true cost” and all other relevant information. 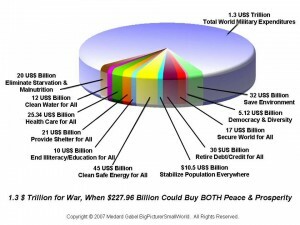 Separately, in support of a forthcoming book, Medard has documented the reality that we can create a prosperous world at peace for one third the price of what the USA alone spends on elective wars and a global armed secretive presence (over 750 military bases world-wide, all at taxpayer expense). The rigorously researched graphic of relative costs is his, used with permission, all rights reserved to him. 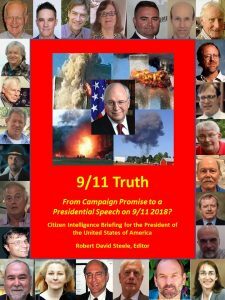 Together we all seek to create a Big Bat 21 for the public that funds a World Brain and Global Game such that every public everywhere has better information and more aggregate insight than any government or corporation or international organization. Medard, who founded and manages BigPictureSmallWorld, has influenced me greatly, as have many others, but few in such sustained depth. Kirkpatrick Sale and his book Human Scale, Paul Goodman and his 1960’s bookCommunitas, are among the critical voices that led me to publish Collective Intelligence: Creating a Prosperous World at Peace (edited by Mark Tovey with 55 contributors), and to write and publish Intelligence for Earth: Clarity, Diversity, Integrity, & Sustainability; as with all my books, the latter two are free online. 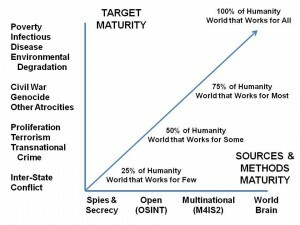 It was with all these minds in mind that I recently created a new graphic to depict how ignorant and ill-suited to our needs are the secret intelligence communities of the world (the US is spending $75 billion a year for what one general says is “at best” 4% of what we need while another says it is all completely “irrelevant” to our forces engaged in combat as well as stabilization & reconstruction). I agree with Gregory Unruh, who has written that transparency is the Internet’s killer app, and also with Jeff Jarvis, who writes of the shift in power from secrecy to transparency. Still, I credit Alvin and Heidi Toffler with the earliest and most developed recognition (in PowerShift: Knowledge, Wealth, and Violence at the Edge of the 21st Century) that information is a substitute for violence, wealth, time, space, and labor. However, having access to information is not enough. There needs to be a change in mindset and a change of the game such as Gandhi accomplished in India and Tom Atlee has suggested for us in both Tao of Democracy and the more recent Reflections on Evolutionary Activism. 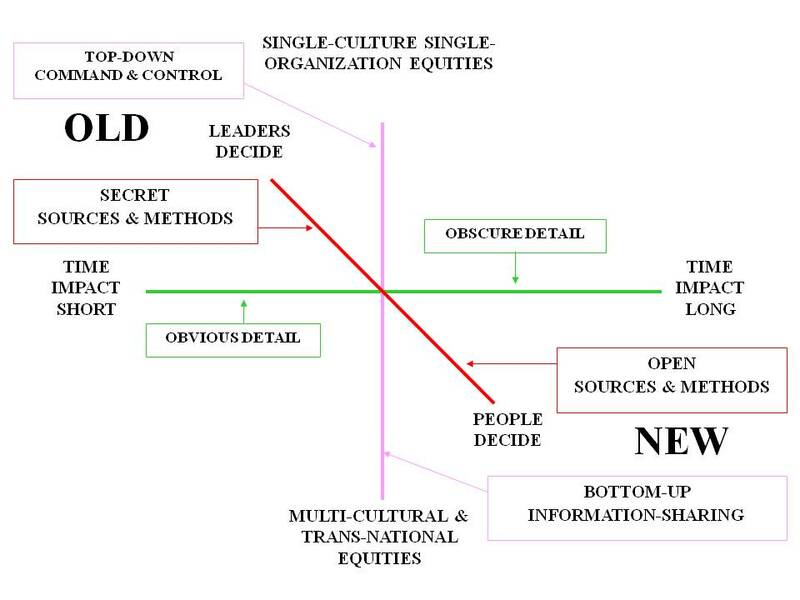 As Russell Ackoff urged in his paper “Transforming the Systems Movement,” we have to stop doing the wrong things righter and focus instead on doing the right things. In my view, the two-party tyranny and its shadow substitutes No Labels and Americans Elect as well as IndependentVoting.org, are all efforts to mislead the public into thinking that we can stick with the status quo electoral system that has been thoroughly corrupted, we just need to elect the “right” kind of people. Not so. Below I list tiny handful of especially insightful books on changing the game, and my two lists of lists that sort all my recent reading in easy to access categories. 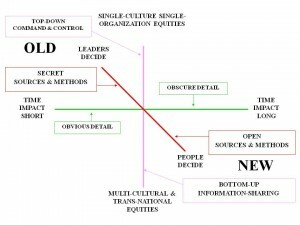 Designing A World That Works For All boils down to clarity (not the theater we get now from politics and the media); diversity (all of us — every single one of us, as informed participants in our self-governance); integrity (not something visible in any organization with shadowy financial backers and hidden agendas); and finally, a commitment to sustainability (playing for the long term, for our children and their children). 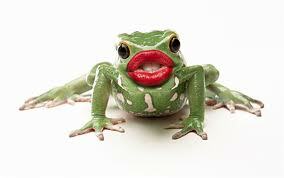 Put simply, and now that the Internet and GroupOn and Twitter and other emergent capabilities make this possible, the time has come to end Rule by Secrecy and top-down decision-making that is not in the public interest. We now have the power–both technologically and financially–to create a Big Bat 21 for We the People (imagine 100 million citizens paying and average of $10 each) to fund a public intelligence network, a public policy network, and a public budget oversight network, all three working at all levels from municipality to county to state to nation to world. Joe Trippi and Zephyr Teachout proved that We the People can–in the aggregate–outspend Wall Street….but we have to want to! In my view, and I wrote about this as Obama’s Choice, we have in the next 30-90 days a transformational opportunity in America. 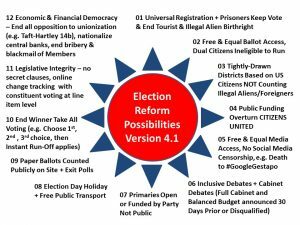 We can demand Electoral Reform (1 Page, 9 Points) of every single one of our Senators and Representatives, and of our President, and we can demand a roll call vote on this simple restoration of public sovereignty — those who vote against it can be recalled by their constituencies and replaced by the 4th of July 2011. Restoring the clarity, diversity, and integrity of our electoral system in time for 2012 is what Buckminster Fuller would call “Prime Design.” It is fundamental. Absent that reform, everything proposed by the government, the corporations, the two-party tyranny, No Labels, Americans Elect, IndependentVoting.org, the churches, the unions — none of it is relevant to getting America back on track. Electoral Reform. Now. “Yes, We Can” Change the Game. 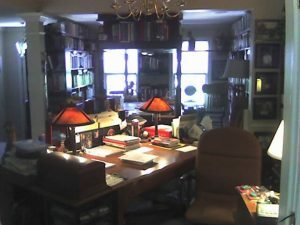 The author is unemployed and seeking righteous work. Have brain, will travel.